The F80 treadmill has been reviewed as “The best treadmill in its price range” by both consumers and numerous consumer resources. The F80 treadmill steps up to an industry leading warranty and the Cushion Flex Whisper Deck, shown in a study to reduce impact up to 40% as compared to running on asphalt. Not only does the deck perform like other commercial brand treadmills (costing literally thousands more), it’s also covered by a lifetime warranty. The strong, 3.5 Cont. Duty HP motor delivers challenging speeds up to 12 mph. and inclines up to 15 levels. And when not in use, the treadmill deck safely locks into place, 100% secured. *New for this year, the F80 also now includes blue tooth capability. Allowing users the freedom to transfer workout data from their fitness equipment to their smart device. Users can track their fitness info on the Sole app, or have their data be transferred to other compatible fitness apps. 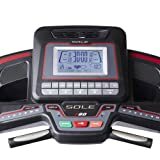 Priced To Please, Built To Perform The F80 treadmill has been reviewed as “The best treadmill in its price range” by both consumers and numerous consumer resources. The F80 treadmill steps up to an industry leading warranty and the Cushion Flex Whisper Deck, shown in a study to reduce impact up to 40% as compared to running on asphalt. Not only does the deck perform like other commercial brand treadmills (costing literally thousands more), it’s also covered by a lifetime warranty. The strong, 3.5 Cont. Duty HP motor delivers challenging speeds up to 12 mph. and inclines up to 15 levels. And when not in use, the treadmill deck safely locks into place, 100% secured.